Fouad M. Fouad (Lebanon); Bernard Gerbaka (Lebanon); Jeffrey Goldhagen, M.D., MPH (United States); Joseph Haddad (Lebanon); Samir Khalil (Palestine); Nick Spencer (UK), Tony Waterston (UK); Jean Bowyer (UK); Joop de Jong (Holland); Ayesha Kadir (Denmark); Shanti Raman (Australia); Raúl Mercer (Argentina); Barbara Rubio (Spain). Fouad M. Fouad; Bernard Gerbaka; Joseph Haddad, Gina Cordahi; Rouba El Khoury; Maya Abou Khouzam; Carol Hijazi. Engagement of ISSOP against the climate change: choose your personal low carbon footprint and win the ISSOP Sustainability Prize! You will find an overview on visa requirements to enter Lebanon here - Please note that if you have an Israeli stamp on your passport you will not be allowed to enter the country. If you do, you are advised to renew your passport. - Be also advised that every person registering for the conference needs to undergo a vetting procedure. Once cleared you will be informed via email. PLEASE do not make any flight or hotel plane reservations until you have received this confirmation. The confirmation will be sent to you via email. All funds received will be returned in full if there is a problem with vetting.. The organizers do not accept any responsibility for injuries/damages or losses sustained by persons or personal belongings during the conference. Participants are strongly advised to carry appropriate travelling and health insurance. 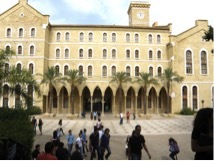 The following accommodations are all in proximity to the Conference site at American University of Beirut. Please note that they are a distance from the Preconference venue at Saint Joseph’s Hospital. Please use the conference code ISSOP2019 when making reservations.